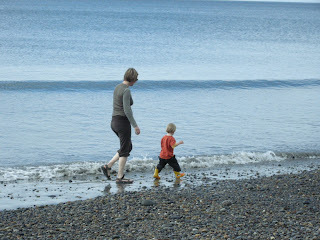 We went on our first camping trip this year, on Agate Beach near Masset. Beautiful spot, the campspots are right on the beach, you hear the waves coming and going continuously. 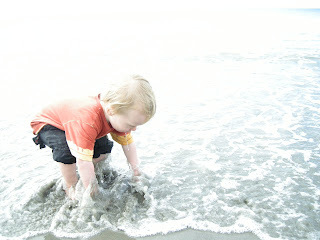 Lief just loved exploring the beach, and especially going in and out of the water. It wasn't very warm, but he didn't seem to mind, as usual. I'm always surprised how well kids can deal with cold water. 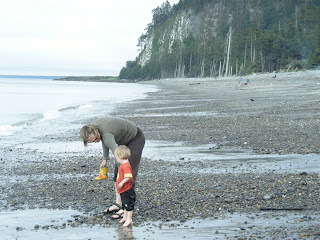 Agate Beach is named after all the agates you can find there, it's beautiful! missing you Kiki. i have been pretty out of touch, busy in my own summery world. only now that i have a cold am i finding some time to peruse and catch up with friend's blogs. funny. thanks Amber, I haven't posted for a while but your response inspired me to finally make a new entry.